Say hello to vintage style icons! Today we are going to see Western 1970's street style inspiration that is recreated in modern ways. This is a fantastic style, what has a unique spirit. 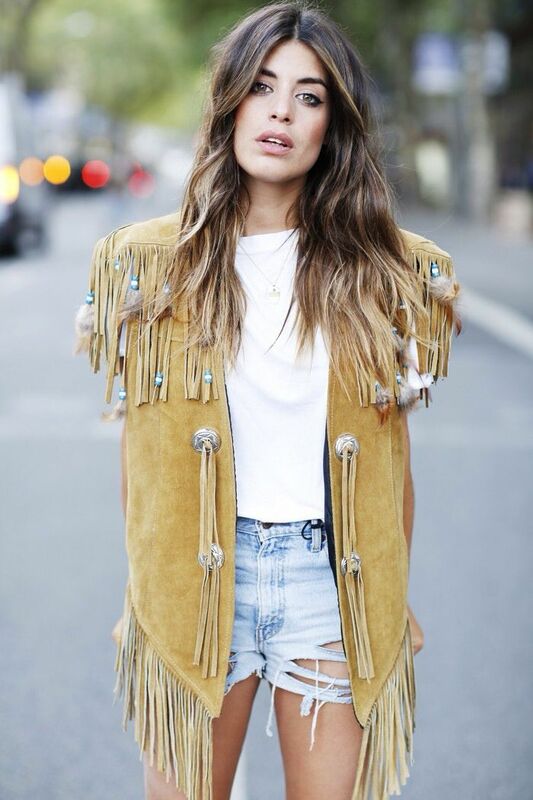 if you are one of those ladies who wants to add a bit of spin in her look, then go for a Western-inspired look. Keep it chic and sophisticated. Go for a suede cream brown biker jacket and style it with grey pullover and white skinnies. Complete the look by adding aviator sunglasses. It will add a perfect twist to your outfit. There are plenty of beautiful garments to use in order to achieve unique 1970's look. You can try on high-waisted, wide-legged pants, suede skirts, chambray shirts, maxi gowns, buttoned denim sundresses, cork-wedge sandals, chunky jewelry, statement sunglasses, etc. Personally, I love finding clothes that look 1970's inspired, but with a unique update that smells modern. To show how to rock this tricky trend and not look like a real cowboy, I’ve rounded up 21 outfits that incorporate Western wear. Keep on scrolling through the gallery to see plenty of beautiful modern examples of the influence Western culture.